Due to the instability usually experienced when stopping, having a stopping stroke that provides support makes sense. Using a sweep stroke with a climbing angle on the blade will give you the support you need when you have to stop quickly. The same stroke will also provide excellent backwards momentum, support and better steering compared to a traditional back stroke with a high vertical shaft. Please refer to the March 2003 Reflections from the cockpit "The Ignored Reverse Sweep Stroke" for a commentary regarding the traditional reverse stroke versus the supportive reverse sweep stroke. If you are looking for support when you need to stop or need support when paddling backwards in rough water, then consider the supportive reverse sweep stroke. After we discuss this stroke we have added a variation of the technique, which is part of Derek Hutchinson's special one day clinics. To begin this style of reverse sweep stroke turn your body so you can place the paddle shaft 45 degrees out from your stern. You will present the back side of the paddle as if you are doing a low brace. It is important to place the blade flat on the water. It is also important that you turn and look at the blade as you place it on the water. The act of looking at the blade causes your body to turn, which provides more power to the stroke and it also allows your opposite knee to lift up to the cockpit coaming. Turning your body also helps protect your shoulder from strains. 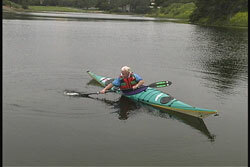 It is very common for paddlers to perform reverse strokes without twisting their body. If you do not turn, your blade goes behind the front plane of your body (blades goes behind your shoulder), which opens your anterior deltoid muscle to strains when force is applied. Once the blade is placed on the water, press down on the blade as you sweep it forward with the leading edge of the blade on a climbing angle so the blade doesn't dive. This climbing angle is what provides the support. You are looking for a compromise between propulsion and support. The forward movement of the stroke will provide resistance when you need to stop if your kayak is moving forward. If you are stationary you will move backwards. Again, you want to turn and face your blade through the entire stroke. By following the blade, with your face, from placement to exit, your body will rotate accordingly. This body rotation provides power, protects the shoulder and helps keep you balanced throughout the stroke. The stroke ends when the working blade passes the 90 degree point. Maintain the climbing angle on the blade as you continue the stroke. When you complete the stroke on one side do the same thing on the opposite side to keep the kayak in a straight line whether stopping or moving backwards. The paddle shaft is kept low to the deck. I learned a variation to the stroke mentioned above from Derek Hutchinson. In performing the stroke Derek recommends using your body weight to provide the power. You need to trust your paddle to provide the support when you lean out over the edge of your kayak. All the aspects of the stroke are the same with the only difference the addition of your body weight to the stroke. 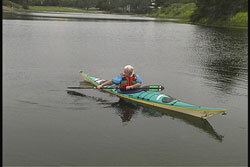 After placing your paddle flat on the water lean out and let your body weight rest on the paddle. As the paddle begins to move let your body weight provide the power. As you can see in the picture, Derek would capsize if the paddle was not there supporting him. His balance point was committed beyond the cockpit. The paddle is still swept forward with the leading edge on a climbing angle. As you bring the paddle forward you also bring your balance point back over the cockpit. Once over the cockpit you are setting up for a stroke on the opposite side. The blade needs to be presented flat in order to give you that initial support when you lean out over the edge. The knee opposite the working blade is hooked under the cockpit coaming. Again, look how Derek commits himself out over the paddle to get that power. The idea behind this variation is using the concept of successive capsizes being arrested by low sweeping braces. 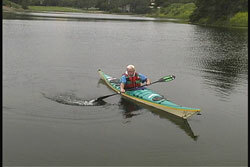 When you see this technique being performed properly it appears as if the paddler is capsizing from side to side, but stops himself with the reverse sweep stroke. After leaning out to do the stroke on each side, you always bring your balance point back over your cockpit. After I learned this stroke and felt confident in trusting the paddle to support me, I was amazed at how much power this technique provided. This is the fastest and most stable reverse stroke I have ever used. It also provides great steering. This stroke is fabulous for emergency stopping. When you perfect the stroke you can stop your kayak in one stroke if you plan it properly. You will also have tremendous support while stopping. 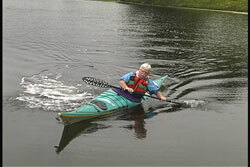 There are a number of different strokes that will move your kayak, turn it or stop it. Which one to use for which situation is up to you. Think about the strengths of each stroke and decide which conditions the strokes are best suited. When it comes to backing up or emergency stops ask yourself how you feel with your present reverse stroke. If you don't remember, go out and paddle forward. After picking up some speed try an emergency stop. If you think you need more support from your current stopping technique, then consider learning and practicing the skills we have just discussed. 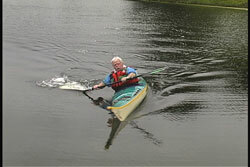 If you want to learn more supportive strokes that can be used in rough water or would like to see Derek demonstrating the strokes mentioned above, go to the USK Store and order your copy of "Beyond the Cockpit".